HONOLULU, Hawaii, September 20, 2015 (ENS) – The U.S. Navy has agreed to limit its use of sonar and explosives training that harms whales, dolphins and other marine mammals off Hawaii and California in a settlement with environmental groups. Signed by a federal judge in Honolulu, the combined settlement of two cases orders limits or bans on mid-frequency active sonar and explosives in areas of vital habitat around the Hawaiian Islands and Southern California, said Earthjustice attorney David Henkin. “If a whale or dolphin can’t hear, it can’t survive,” said David Henkin, an attorney for the national legal organization Earthjustice, who brought the initial challenge to the Navy’s latest round of training and testing on behalf of Conservation Council for Hawaii, the Animal Welfare Institute, the Center for Biological Diversity, and the Ocean Mammal Institute. “We challenged the Navy’s plan because it would have unnecessarily harmed whales, dolphins, and endangered marine mammals, with the Navy itself estimating that more than 2,000 animals would be killed or permanently injured,” said Henkin. “By agreeing to this settlement, the Navy acknowledges that it doesn’t need to train in every square inch of the ocean and that it can take reasonable steps to reduce the deadly toll of its activities,” he said. The Navy’s plans estimate the training and testing could kill 155 whales and dolphins off Hawaii and Southern California, mostly from explosives. The Navy estimated it could cause more than 11,000 serious injuries off the East Coast and 2,000 off Hawaii and Southern California. Yet, until now the Navy has refused to set aside biologically important areas to minimize such harm to vulnerable marine mammal populations. Until it expires in late 2018, the agreement will protect habitat for the most vulnerable marine mammal populations, including endangered blue whales for which waters off Southern California are a globally important feeding area. Still, the Navy will continue some of the training. Lt. Cmdr. Matt Knight, a U.S. Pacific Fleet spokesman, said the settlement preserves key testing and training. “Recognizing our environmental responsibilities, the Navy has been, and will continue to be, good environmental stewards as we prepare for and conduct missions in support of our national security,” Knight told the “Stars and Stripes” newspaper. Under the agreement, the Navy cannot use sonar in Southern California habitat for beaked whales between Santa Catalina Island and San Nicolas Island. 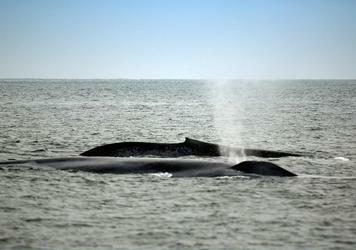 Sonar is not allowed in blue whale feeding areas near San Diego. In Hawaii, the settlement prohibits sonar and explosives training on the eastern side of the Big Island of Hawaii and north of the islands of Molokai and Maui. The groups said that will protect endangered Hawaiian monk seals and small populations of toothed whales, for which the islands are literally an oasis, their only home. The Navy will not be able to exceed a set number of major training exercises in the channel between Maui and the Big Island and on the western side of the Big Island. 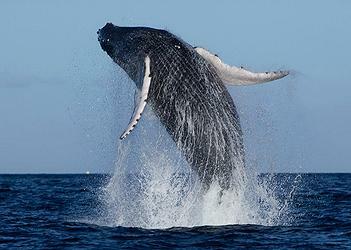 “We can protect our fleet and safeguard our whales,” said Rhea Suh, president of the Natural Resources Defense Council, whose lawyers challenged the Navy’s activities in Southern California and Hawaii on behalf of NRDC, Cetacean Society International, Animal Legal Defense Fund, Pacific Environment and Resources Center, and Michael Stocker.